Mystic Kiteboarding Gear! Harnesses - Wetsuits and more. Fine Design Kiteboarding Gear from Europe. See our Selection Below. 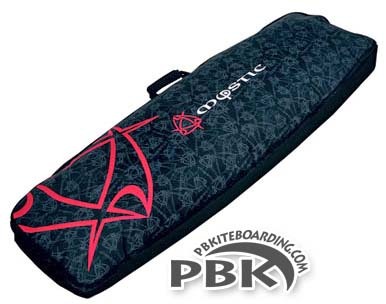 The Mystic Venom Double kite bag fits 2 boards (with the padded board separator), weighs almost nothing and can carry 2 boards and 1-2 kites comfortably. In 155 length it will fit any modern twin tip board, and still have enough room for a kite or more. We have many customers who travel with the Mystic Double Kite bag around the world as their main kite gear travel bag! 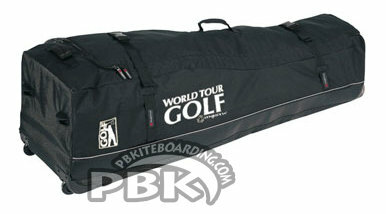 If the best traveling bag is what you are after, then you have found it: World Tour Golf bag with wheels. Finally a bag that is ultra-light, with smart padding where it's necessary (bottom and sides where your board(s) will be - no need for bulky padding that increases weight and reduces volume), super strong, and will hold your bigger board!